We love taking little trips to water parks that are within a decent driving distance of our home for a night away with the kids. It is a perfect excuse to get out of town for some family fun. I have heard great things about Kalahari and we will be traveling there sometime in the near future. Kalahari is located in Sandusky, Ohio, just 2 hours and 15 minutes from where I live. 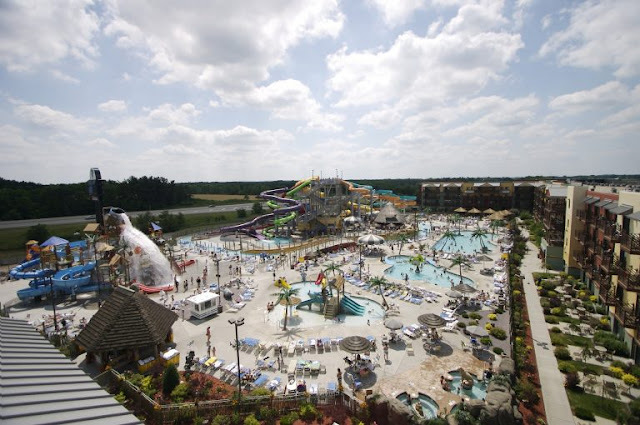 **Keep reading for a giveaway to Kalahari Water Park for a 1 night stay! Indoor water parks are perfect for people of all ages. We took our baby there for the first time at 10 months old, my 3 1/2 year old loves them and so do my husband and I. It is a ton of fun and seeing the joy in my kid's eyes is the greatest. There is always so much to do at the water park and the kids never want to leave (unless my daughter needs a snack haha). There are a few Kalahari Resorts and Conventions and we will be visiting the one in Sandusky, Ohio. It has an African design and is always 84 degrees. It is 28 degrees today here in Michigan so I am excited for a night away that is 84 degrees!! It is America's Largest Indoor Water park and I can't wait to check it out. 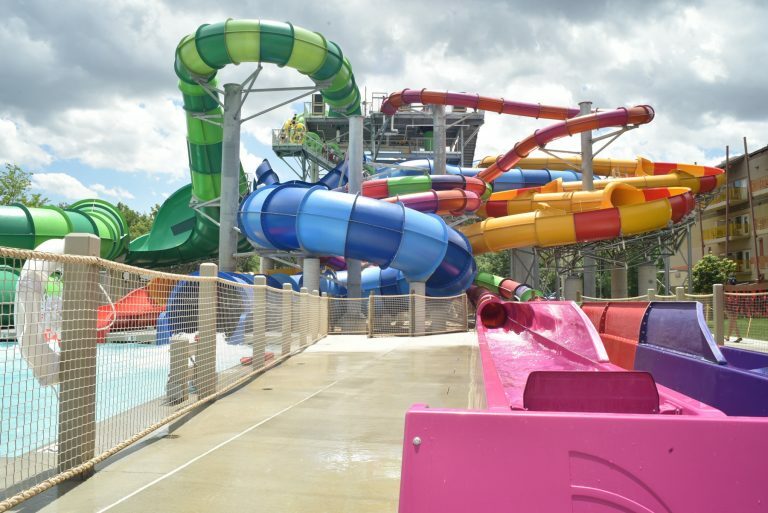 It features 173,000 square feet of space including many water slides, a water coaster, a lazy river, a wave pool, kids' areas and more. Outside of the indoor water park areas, there are other activities to do including a big game arcade room, a seasonal outdoor water park, outdoor ropes course and zip lining. They have on-site dining options, a spa and a salon. They have kids' activities daily including crafts and character appearances, an arcade and indoor glow golf. o Float Tank – Spa Kalahari and Salon will be introducing a Float Tank this spring! In water temperatures that match your body’s own internal temperature, you float, suspended in a bath of Epsom salt or magnesium sulfate. Learn how to relax in the deepest sense of the word—weightless, silent, peaceful. o Bugs Burrow - The mind-bending experience offers kids the chance to imagine what it would be like if they were the size of a bug. The community of Bugs Burrow features a myriad of lovable cartoon insects and critters that welcome Kalahari’s smallest guests to splash, play and have fun. This attraction will be coming this summer! o B-Lux Grill & Bar - home of handcrafted burgers and shakes. The new restaurant captures the latest craves through its robust influence of American-style food with fresh ingredients that are locally sourced. What are you waiting for? Book your indoor adventure now! The giveaway will be for a 1 night stay at the Kalahari Sandusky location. **Overnight voucher that will be good Sunday – Thursday nights for one year – holidays excluded. Voucher includes: Overnight stay at a resort of the winner’s choosing in a standard desert hut room (sleeps four). Yes, we have been to an indoor water park and my kids love it!! We have never been to Kalahari. Looks like a lot of fun! I have never been to a waterpark before. We've been to a few water parks, the kids love the slides and wave pool! This past summer my family took our first family roadtrip vacation where we drove from Ohio to Kansas to visit family. While there we went to a waterpark and it was amazing! This was a first for my kids and they truly enjoyed it. We have never been to Kalahari and I am certain they would enjoy it. It looks so family friendly! My kids are little but big enough to enjoy much of what Kalahari has to offer! We live in IL so we go to Wisconsin Dells once a year. Never been to the Ohio one but we love the Wisconsin one. Love that its kid friendly and we have have a blast. I have been to Cedar Points water park! We have been to our local waterpark but thats it for us! We have been wanting to go to Kalahari! Not this location no, but we've been to the one in the WI Dells before. We havent been to a water park but this one is so close to us. I had no idea that it existed ! But whoa look at how much fun!